COSLA (the employers) tabled an offer on 7 January. No further improvements were presented. For those on the main-grade scale the offer essentially remains the same as the one previously rejected in the consultative ballot (3% plus a further 2% in August), with the addition of 3% for Year 2 (2019/20) and 3% for Year 3(2020/21). The SNCT Teachers’ Side (SSTA, EIS, NASUWT, Voice, ADHS and SLS) met on 8 January and rejected the COSLA offer and also recorded a “failure to agree”. 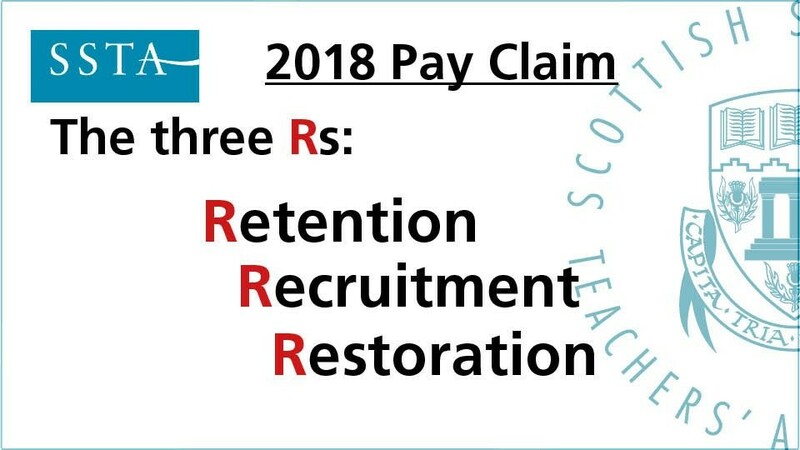 In an attempt to agree a settlement, the Teachers’ Side confirmed its willingness to meet again, as and when required should any improved offer from COSLA / Scottish Government be forthcoming. The DFM issued a letter late on 10 January. The DFM sets out the willingness of Scottish Government to improve the 7th January offer by restructuring the 2% originally being offered in August 2018 to a new figure of 3%, payable in January, 2019. The net impact of this change is that over a 2-year period the offer would be worth a 9.25% increase compared to March 2018 [3% April 2018 (backdated) + 3% January 2019 + 3% April 2019]. For Headteachers on more than £80,000 it would be worth slightly less as the April 2018 offer is capped at a flat rate of £1,600; and for probationers and those on main grade Point 1 it is worth more as the proposal would still be to shorten the main grade from 6 points to 5. A further proposed 3% in April 2020 would take the compounded increase to 12.5%, compared to March 2018, i.e. current scales. However, at the moment the DFM’s letter is not an offer. Only COSLA, as our employers, can legally make an offer. COSLA has said it cannot consider making an offer until its Leaders meeting planned for 25 January. It cannot be taken as a formality as COSLA has had difficulties internally in making any improved offer to teachers’ pay throughout the negotiation process. The SSTA Salaries and Conditions of Service Committee will consider developments at its meeting today. In the absence of an improved offer from COSLA it will need to plan the next phase of the campaign including moving to a statutory ballot for strike action. Further updates will be issued. The Independent Panel on Career Pathways has been set up to gather evidence in relation to possible new career pathways for the teaching profession to address the issues related to recruitment and retention, and to provide recommendations to the SNCT. As an element of its evidence-gathering work, the Panel has organised a consultation event exclusively for BME teachers.